The city of Helsinki is not only the largest city in the country it is also the capital of Finland. You can find Helsinki in the southern portion of Finland. As the nation’s capital, it is a popular destination hotspot which attracts countless visitors every single year from all over the country and throughout Europe. In the southern portion of Finland, you will find the bustling city of Tampere. Known as the second most populated city in the country, one can find a number of things to see and do in and around the city today. The nearby lakes of Pyhäjärvi and Näsijärvi can be found on either side of Tampere. The city is known for its industrial achievements. The southwestern city of Turku can be found along the banks of the Aura River. Because of its locale, the city of Turku is a popular stopping point for many passengers making their way to Mariehamn and Stockholm. There are more than three million passengers traveling through Turku every single year. In the northern par of Finland, you will find the city of Rovaniemi. Situated atop the Korkalovaara and Ounasvaara, Rovaniemi overlooks the surrounding countryside as well as the Kemijoki River. The city is situated a mere 5 kilometers from the Arstic Circle and has become a popular destination for many travelers in recent years. The city of Vantaa is considered to be the fourth most populous city in the entire country. It is also home to the largest airport in Finland and as such, more visitors make their way through Vantaa than any other city in the nation every single year. There are many things to keep anyone busy throughout the city no matter what time of day it is. The city of Oulu can be found in the northern part of Finland. Oulu is the sixth largest city in the country. Because of its location, the city is considered to be one of the northernmost in the country. The city of Oulu is most famously known as a living lab as the residents of the city often participate in many experiments regarding newly developed technology. The most popular skiing destination in all of Finland can be found in Rukatunturi. The area offers its visitors more than 500 kilometers of tracks for cross country skiing. There is also a number of skiing competitions held in the area every single year. With 29 slopes and 20m lifts, year round skiing is possible in Rukatunturi. The small town of Savonlinna can be found in the southeastern part of the country. While there are many fine lakes in the area, the most popular destination in Savonlinna is that of the 15th century Olavinlinna castle which was built to protect the Swedish-Russian border. The castle stands as a reminder of the rich history in the area that surrounds Savonlinna. The second largest city in the whole of Finland is none other than that of Espoo. The city is nestled along the Gulf of Finland shoreline. The city is also home to the Nokia Corporation which has become one of the most popular cell phone manufacturers in the world. Every year countless people make their way to Espoo. The city of Jyväskylä can be found in the central portion of Finland. Nestled along the northernmost banks of the Päijänne Lake, the countryside which surrounds the city is densely forested. Known by many as the Finnish Athens, Jyväskylä has quickly grown to become a very popular tourist destination over the years. In the northern part of Finland, you will find the ninth largest city on the country, Kuopio. The city is densely populated and home to almost one hundred thousand residents. There are many different things to see as well as do when choosing to visit Kuopio almost any time of the year. The largest skiing location in the entire country of Finland can be found in Levi. The city is situated within the Arctic Circle and is home to 48 different slopes which are serviced by 26 lifts. 18 of the slopes in Levi are lit for nighttime skiing. There is also 230 kilometers of tracks for cross country skiing and 886 kilometers for snowmobiling. The city of Lahti can be found nestled along the banks of the Vesijärvi Lake. It is only a hundred kilometers from the capital city of Finland and as such, has grown to become a popular destination for those wishing to escape the hustle and bustle of urbanized living. Many people from all over the country make their way to the peaceful countryside which surrounds Lahti. 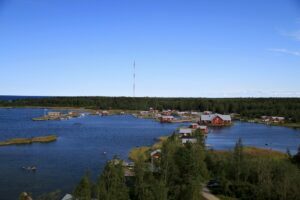 In the southeastern portion of Finland, situated along the banks of the Saimaa Lake, one can find the town of Lappeenranta. Located only 30 kilometers from the Russian border, the town of Lappeenranta has become a popular stopping point for people traveling between the two nations. The awe inspiring views of the countryside surrounding the city have continued to attract countless visitors every year. Located on a peninsula, the city of Mariehamn is a popular stopping point for people visiting Finland. There are two harbors in the city that are situated on either side of the city. Many ferries come through the harbors in Mariehamn on their way to Sweden and other points within Finland. The city of Porvoo can be found along the southernmost coastlines of Finland. It is considered by many to be a medieval town. Porvoo is also the home to the Diocese Evangelical Lutheran Church of Finland and as such has attracted a great number of pilgrims to the city over the years. In the southwestern part of Finland you can find the city of Naantali which is considered by many to be the number one tourist destination hotspot in the country. The city encompasses a number of islands which features beautiful picturesque sceneries and a truly relaxing environment. Countless visitors to Finland find their way to Naantali every year. With more than one million annual tourists to Kuusamo, the city has grown to become one of the biggest destination hotspots in the country. The city is home to one of the largest ski resorts in the country which is known to hosts a number of major competitions every single year. Along the western shorelines of Finland, you will find the city of Vaasa. Countless individuals come to Vaasa every single year because the city is known as an important cultural center. With less than a hundred thousand inhabitants, the city swells every year as many people make their way to Vaasa to experience the Finnish-Swedish culture first hand.